Which Creative WordPress Themes Are Best For Beginners? Do you work in the industry that takes some sort of creativity to flourish? Then, without doubt, your website has to be creative and inventive as well. However, to power such a website from scratch you’ve got to be versed in web design and know at least some coding. How Can a Baffled Beginner Power a Creative WordPress Website? If you’re new to creating websites, then using a drag-n-drop WordPress theme will be your go-to solution. These themes are both intuitive and feature-rich, delivering you the breathtaking designs that are easily customizable in a drag-n-drop editor. How Can a Complete Beginner Benefit From a Drag-n-drop Creative WordPress Theme? First of all, all the beginner-friendly WordPress themes install in less than 5 minutes, and the process is fully automated. You just have to upload the theme folder to your server and follow the simple steps of the comprehensive installation wizard. Once the template is installed, its appearance will fully match the Live Demo. Secondly, all the beginner-friendly WordPress themes come with visual builders. So, to add new content to your website and manage the blocks, you won’t have to resort to working with HTML or shortcodes. You just open up the visual editor and click the content you’d like to change with your mouse. To resize and move the blocks, you’ll also need only the mouse and nothing else. Third, with a modern beginner-friendly theme, you don’t have to delve into SEO and performance optimization. These aspects have already been taken care of by the developers. The same holds true for mobile devices and Retina screens optimization. So, you can just lie back and do your content part of it all. Which Art WordPress Themes Are Best For Newbies? Sometimes, it may be hard to know for sure whether the theme is beginner friendly without actually testing it. Crooked template provides may trick you into buying their themes and then seeing it’s not all that simple as promised. That’s why we strongly recommend that you buy your beginner-friendly template from a renowned and reputable template provider. For your convenience, we’ve compiled a list of the best creative drag-n-drop WordPress templates and WordPress themes one page designs. You can see it below. Details | DemoFlydance is a stylish art template for a modern dance studio. This theme brings you the supreme designs for six major website pages and an abundance of additional blocks and content modules to enhance content creation. Details | DemoGravitas is a premium multipurpose template with 7 different homepage designs on board. This theme offers you as much as 30 ready-made pages, a drag-n-drop editor and two bonus plugins: an e-commerce plugin and Advanced Contact Form. Details | DemoThe Vera template employs the contrasting monochrome hues to create a new level of elegance and ensure the appeal of your site’s UI. This template brings you a pack of additional content widgets and blocks to provide for the trouble-free content creation experience. Details | DemoTomy Artistico is a bold and creative photographer gallery template that has a superb 2019 design. You can customize this template with Elementor page builder and enjoy the special bonuses, such as all imagery and JetElements plugin included for free. Details | DemoCreative Studio is an atmospheric, well-delivered template for a music website. It’s a good match for a nightclub, music hall, or online music club site. With the theme, you can tap into rich media integration, embedding YouTube and Vimeo videos and uploading media files to the media library of your website. Details | DemoAromacafe is a charming WordPress theme that cherishes the sweet tooth of your site guests. With the template, you get a pack of Cherry plugins that provides for extended functionality of such website pages/blocks as Team Members, Testimonials, Gallery, sidebars, search, etc. Details | DemoGreat and artistic, this theme appeals to all modern art lovers and lets you spread your interest on the Internet. To beautify your website and make it more convenient, the template integrates the ready-made Contact and Subscription forms, iconic and Google Fonts, multiple widgets and a Preset Builder. Details | DemoThe FrameMe theme relies on the subtle pastel shades that look clean and charming. In terms of functionality, the theme is one of the most powerful for the niche. It incorporates Cherry plugins, Elementor, Jet Plugins and an appointment booking system. 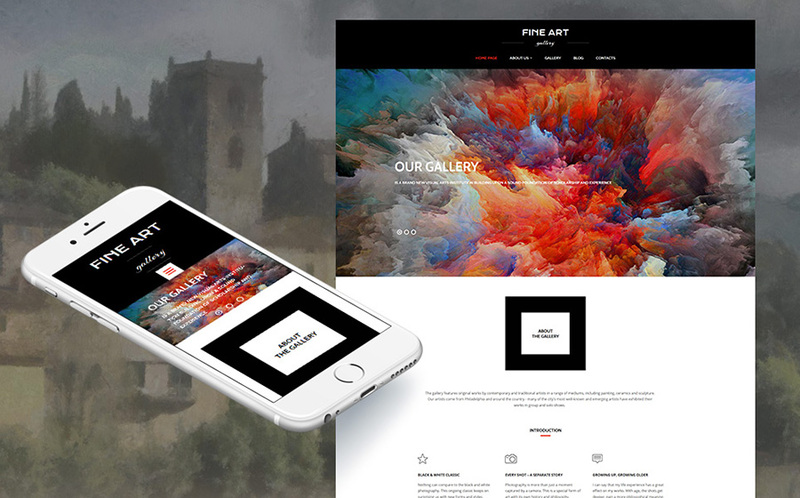 Details | DemoOne of the best art gallery templates on the market, Fine Art theme allows you to create a visually appealing template with video backgrounds, animated sliders, and rich imagery. This template comes with an inbuilt WYSIWYG editor, MotoPress Editor that allows you to edit the theme with simple drag-n-drop. Details | DemoElegacy is an ultra-friendly 2019 theme that incorporates geometric shapes, particle backgrounds, gradients and creative layouts for a maximized appeal. The theme brings you the renowned Elementor, one of the most advanced visual editors on the market. Moreover, the theme brings you a number of user-friendly, flexible and easy-to-use instruments for site customization. Details | DemoHOTOprint is a bubbly and upbeat print shop template that incorporates a prebuilt builder with no coding. With a rich widget toolkit, you can diversify your website’s sidebars and main content areas with audio and video posts, image galleries, social buttons, etc. Details | DemoRichard Gore is a magnetic and engaging template for an aesthetically pleasing writer website with Elementor page builder on board. Elementor lets you add social buttons and widgets, interactive calendars, toggles and carousels on the fly with drag-n-drop. Details | DemoThis photographer portfolio theme has a pretty simple and minimalist, yet, ultimately appealing and sensual design. No coding skills are required to customize this cutting-edge template. So, click the text to adjust the wording and styling, click the blocks to re-position, change backgrounds and add new widgets with drag-n-drop, simple as that! Details | DemoMagnifix is a thought-provoking minimal template that provides for building an outstanding present-day web presence. The advanced template visual editor, Elementor, lets you choose between different pre-made content blocks and create your own page layouts. The builder has an inbuilt library of layout presets, which makes layout customization quick and simple. Details | DemoIf your photography crosses the boundaries of art and fashion, CPM is the right website theme to embrace. Its creative layouts oppose the rules of strict symmetry and turn your website into an intricate piece of visual art. Are you captured by the awesomeness of these best creative and beginner-friendly WordPress themes? If you go for one of them, you’ll uncover the hidden nice extras as you work with it. Thanks to round-the-clock support and extensive documentation, these themes are bound to become your loyal friends and assistance in building a website of your dream. So, grab one of them and take your website up a notch with it! We would be happy to hear about your favorites in the Comments section. If you have any questions, do not hesitate to drop a line below. Need help or in-depth customization? Want a new website? Since 2008, we create easy to use WordPress themes for churches, restaurants, businesses and nonprofit organizations that work straight out of the box.